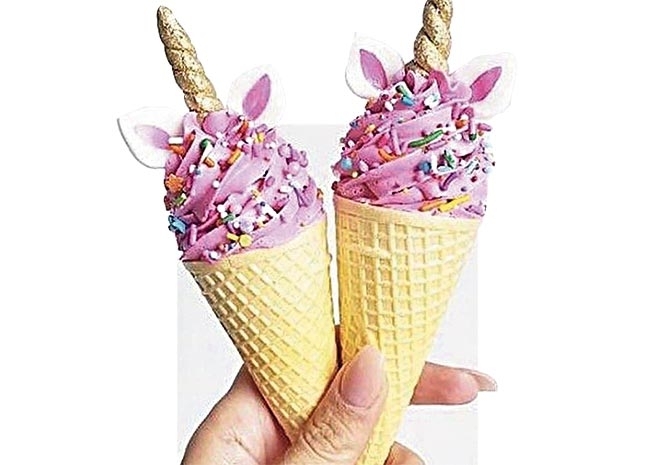 GLITTER FEVER: Has the ‘unicorn food’ trend gone too far? WHAT’S the 2017 food trend you’d most like to see the back of? For some, it’s sharing plates that come out in the order that suits the kitchen, and waiters taking orders without notepads. Plus: communal seating, no bookings, no getting in. Except for making you stand in a line outside in the rain, driving hipsters into a frenzy to get in because of the long, long queue way down the street. We generally eat what we’re familiar with; but different cultures are used to different things. Intestines, insects and other nutritious foods are repellent to many in the West, but commonplace elsewhere. Milky turmeric drinks, for instance, seen as a fad in Britain, are not unusual in India. Asian families in the UK drink turmeric milk but not as a fancy drink but when you have a cold. You’d simply be laughed at if it was served to guests as a delicacy. It’s weird how something can become hip and pricey if it’s sold to a different demographic. And what about food trends for 2018? As far as weddings are concerned, couples apparently still want ‘Instagram moments’ – and cakes with moving parts. Like a recently created four-tier cake with a spinning unicorn in the second tier. Really! All this plus doughnut walls, DIY biscuit-decorating stations and displays of confectionery. Sounds more like food aimed at toddlers. Are these people old enough to get married if they need to be stuffed with all this childish nonsense? Nora Johnson’s psychological crime thrillers ‘The Girl in the Red Dress,’ ‘No Way Back,’ ‘Landscape of Lies,’ ‘Retribution,’ ‘Soul Stealer,’ ‘The De Clerambault Code’ (www.nora-john son.net) available from Amazon in paperback/eBook (€0.99; £0.99) and iBookstore. All profits to Costa del Sol Cudeca cancer charity.